Which antibiotic resistance gene does my plasmid have? Few experiments in science are conclusive. So, it is very exciting when an experiment provides completely unambiguous results. Today that happened. Molecular biologists use bacteria–specifically strains of E. coli that don’t make people sick (i.e., non-pathogenic)–to make lots of copies of circular DNA, called plasmids; one can think of E. coli as a photocopier for plasmids. Bacteria love to take up plasmids, copy them, and express them to make proteins with unique functions, and it is this ability that makes them so evolutionarily successful. Bacteria can transfer plasmids containing antibiotic resistance genes to each other, for example, and in this manner, can become “superbugs.” Staph is one pathogen that has done this so successfully in hospitals that we will soon run out of antibiotics to treat it. Interestingly, molecular biologists give E. coli antibiotic resistance genes on purpose. It’s not because we’re bioterrorists. Rather, we want to be able to SELECT for those bacteria that take up our plasmid of interest and copy it. So we make sure that the plasmid DNA that we give the E. coli to copy also has a gene that codes for a protein that confers antibiotic resistance; ampicillin resistance is the most common. We take this plasmid, mix it with the E. coli, and warm the E. coli slightly. This creates little pores in the E. coli that allow the plasmid DNA to pass through. The process–called heat transformation–is not very efficient, and most of the E. coli don’t take up any plasmids. We don’t want to grow these E. coli because they are useless to us; we only want to grow the ones that took up our plasmid. So, we add some ampicillin, and only those E. coli that took up our plasmid DNA can survive. As a result, we end up with a bacterial culture that is loaded with our “photocopied” DNA. The resulting plasmid DNA can be used for many things; for example, DNA that codes for insulin can be copied in E. coli, purified, and then put into mammalian cells to cause them to make insulin, which can be harvested and given to diabetic patients. I recently wanted to use E. coli to “photocopy” some plasmid DNA that I got from another researcher, but the researcher wasn’t sure which antibiotic resistance gene for selection was employed in the plasmid (not good record keeping). He thought it was either ampicillin or kanamycin. So, I transformed E. coli with the plasmid and tried growing the bacteria in both ampicillin and kanamycin. Take a look at the picture below. 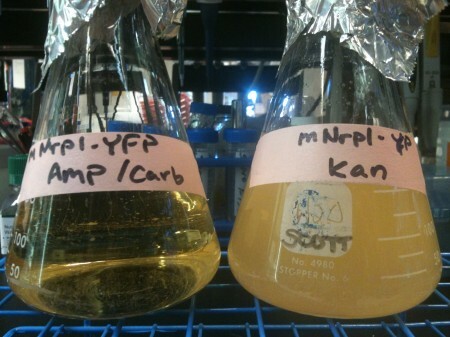 It’s pretty obvious that the bacteria survived only in the kanamycin (yellow cloudy suspension on the right), indicating that the plasmid coded for kanamycin resistance. The bacteria in the ampicillin died quickly and did not grow. Creatine, a small-molecule found naturally in red meat (and biosynthesized in our bodies), is a popular supplement for weight lifters. To understand how it works, one needs to know that ATP (adenosine triphosphate) is the body’s energy molecule. It gives muscles the energy they need to function, but in the process, it loses a phosphate group and is converted to ADP (adenosine diphosphate). Creatine monophosphate has the ability to convert this low-energy ADP molecule back into the super-charged ATP molecule that muscles crave. As a consequence, lifters that supplement with creatine can do more reps, which can lead to better results in the gym on a shorter timescale. Creatine supplementation also has the effect of increasing water volume in the muscles, causing them to swell and look bigger; this effect subsides quickly once creatine supplementation is stopped. It is well known that consumption of simple sugars with creatine increases creatine absorption. When you consume sugar, your blood-sugar level increases, and your body releases insulin in response (assuming you don’t have type 1 diabetes). Insulin instructs the cells to take up sugar from the bloodstream. Insulin also has the nice effect of stimulating creatine transporters, which transport creatine from the blood into cells. I was at GNC yesterday buying some creatine. I looked at the ingredients on the GNC-brand creatine and gasped. Creatine and sucralose!?!?!?! Sucralose??? OK- a little more background. Sucralose is a zero-carbohydrate, synthetic, sugar mimic. As you can see below, it looks a lot like sucrose, only it has some chlorine groups that basically make it unrecognizable by the body’s enzymes. So your tongue recognizes it, but your waistline doesn’t because it’s not metabolized. Now to the remarkable part. Sucralose has no effect on the blood sugar level. So this GNC-brand product that I bought containing 17% sucralose/83% creatine is ridiculous. Uninformed weightlifters don’t want “sugar” calories so the industry introduces 1 g calorie-free sucralose per 5 g creatine, which has no effect on creatine uptake and actually tastes quite disgusting (sucralose is 600x sweeter than sucrose, which is regular sugar). So who is the bigger idiot? How many times have you heard someone refer to the “biggest bottleneck” in some process? I’d guess at least once a week if you’re an engineer. Now think about that for a moment. Biggest bottleneck? Exactly how much flow does a BIG bottleneck suppress? I didn’t have this epiphany until I typed “smallest bottleneck” in my dissertation. But “biggest bottleneck” wins over “smallest bottleneck” by an 84:1 margin according to Google. It is not rigorously an oxymoron, however, because there could literally be a series of bottlenecks and one could be the biggest (i.e., largest bore diameter), but the manner in which the term is commonly used suggests a contradictory role between the adjective and noun. I guess it’s like people saying “I could care less” when they mean “I couldn’t care less.” Am I crazy or does this bother anyone else? “Accuracy above all else,” I say. Bennett, M. A.; Yoshida, T. J. Am. Chem. Soc. 1978, 100, 1750-1759. Arroyo, M.; Bernès, S.; Brianso, J. L.; Mayoral, E.; Richards, R. L.; Rius, J.; Torrens, H. J. Organomet. Chem. 2000, 599, 170–177. López, O.; Crespo, M.; Font-Bardía, M.; Solans, X. Organometallics 1997, 16, 1233-1240. Gaydos, C. A. Neurology 2001, 56, 1126-1127.
ten Brink, G.-J. ; Arends, I. W. C. E.; Hoogenraad, M.; Verspui, G.; Sheldon, R. A. Adv. Synth. Catal. 2003, 345, 1341-1352. Usón, R.; Forniés, J.; Espinet, P.; Garcia, A.; Tomas, M.; Foces-Foces, M.; Cano, F. H. J. Organomet. Chem. 1985, 282, C35-C38. I still have four chapters of my dissertation to write and only four days before a draft is due to my committee. I can’t help but to ask myself, Is this the best use of my time? This linked article was originally sent to the Stanford Electrocatalysis mailing list by Chris Chidsey. The author, who claims to be a physicist, reports preliminary evidence on the formation of “HHO gas” by the electrolysis of water. The author claims that while this HHO gas is similar to a mixture of O2 and H2, it is in fact a different substance. The analyses are a joke (i. e. IR spectra of H2 and O2) and the interpretations are equally funny. The fact that this paper made it past the editor and through peer review is mind boggling. Can anyone seriously publish in the “International Journal of Hydrogen Energy” again? Free samples of HHO gas (Aquygen) and instructions for its detection can be requested at www.hytechapps.com. From this website, you can watch the “inventor,” Danny Klein, brush his hand through the HHO flame to show that it is “safe” and does not burn the hand, and then miraculously cut through various materials (nevermind that he turns up the oxygen flow into the torch in between). Can this guy possibly believe that his HHO gas is real?